It’s Friday and you know what that means? Happy hour! Happy hour B.C. (before children) typically occurred in a restaurant, but just because we have kids that want to spend their Friday afternoons running around the backyard doesn’t mean that these two parents can’t enjoy a little happy hour fun right? The hubs and I have recently been playing around with some fun cocktail recipes. We love a good mojito and we also really like cocktails made with vodka. Aparently when the two get married a “vojito” is born! 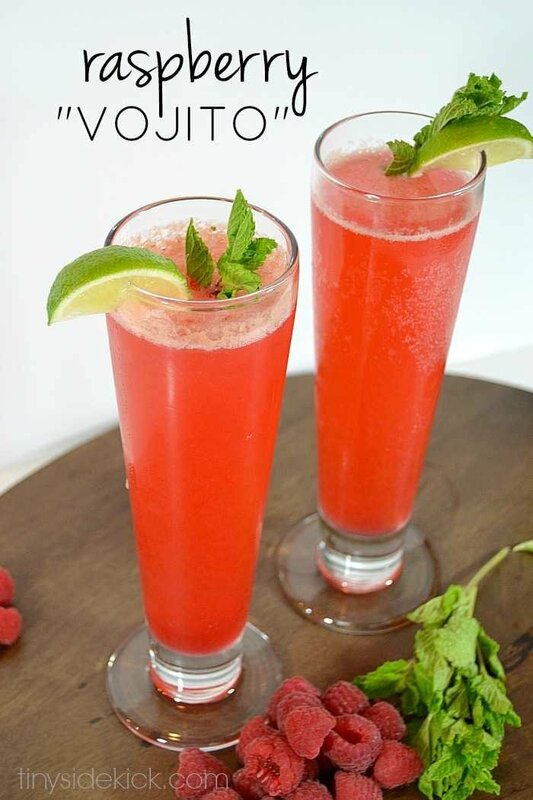 So we did a little experimenting and came up with this super yummy, perfect for summer raspberry vojito with a twist. Who says you have to use rum when mixing up a mojito? Not us! 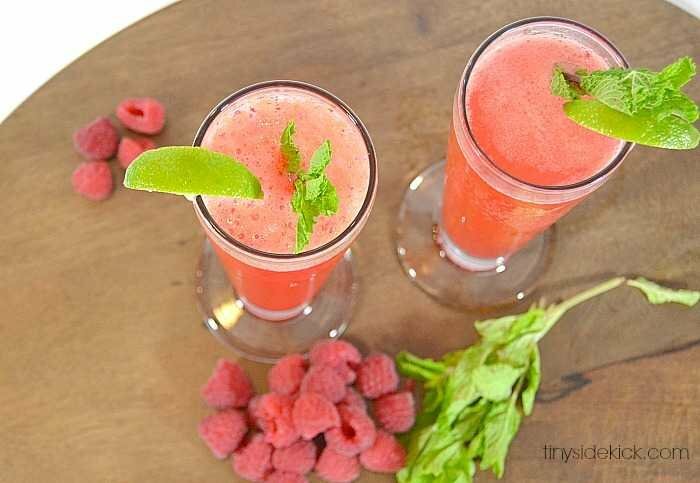 This is going to be the perfect drink to mix up this summer! This recipe makes 4 vojitos. The first step is to make a raspberry simple syrup. It is really easy. Just combine the sugar, water, and raspberries in a small saucepan and bring just under a boil. Turn to low and simmer until slightly thick, about 5 minutes. Strain into a glass bowl to remove the seeds and let it cool before making your cocktail. In a shaker, gently press the leaves of a bunch of mint using the back of a spoon. You want to press enough to release the oils, but not too much or you’ll make your drink bitter. 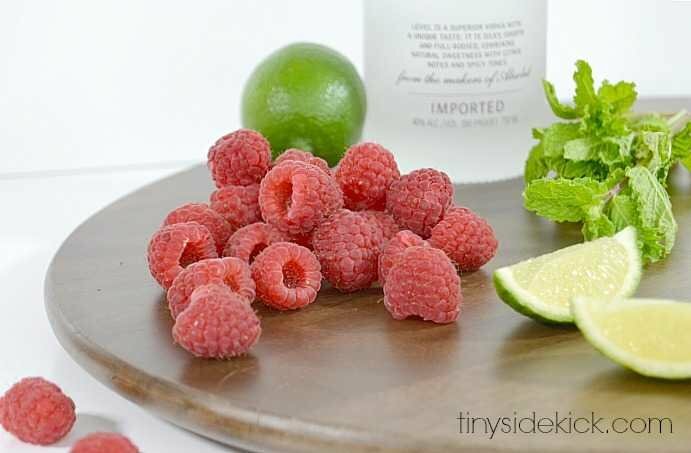 Add the simple syrup, and 1 part lime juice (use sweetened lime juice if you like your drinks sweeter,) and shake to infuse the mint with the syrup. Fill the shaker with ice and 4 parts vodka. Shake for about 30 seconds. Fill each glass (4 glasses) 1/2 way with your mixture and top with tonic water, soda water, or sprite. * We liked ours with sweetened lime juice and tonic water. It made it not too sweet and just a little bit dry. If you like sweet drinks, go with sprite, and soda water would be a neutral. Work with what you have on hand. 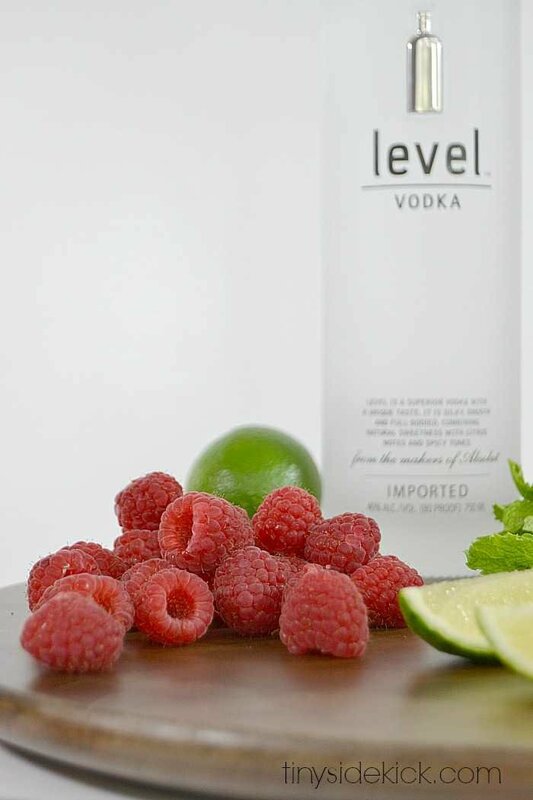 Garnish with a slice of lime and a few mint leaves. Sip and be happy! Outstanding. Great taste on a warm evening around the outside table. Well, next time I’m in CA I know whose house I’m definitely going to stop by for Happy Hour 😉 This looks and sounds so delicious!! Ooh, YUM. Anything that is mojito-based is instantly my best friend. Can’t wait to try this! I’m a sucker for a mojito too Erica! Hope you are doing fantastic!